God has filled the world with wonderful things so we can know how good he is! But wait a minute. Sometimes things arent so wonderful. People are mean to each other, and they hurt each other. Bad things happen. But thats not how God wants things to be. Sin is when we do what we want, instead of what God wants. And when we do, bad things happen. Sin ruins things. Someone always gets hurt. Maybe not right away, but someone always gets hurt sometime. And it only gets worse and worse. But it's not God's fault, it's ours. But bad things happen, and people think its Gods fault. They think God cant be good if bad things happen. And then they cant believe God loves us. Thats the terrible thing about sin. It keeps people away from God. Thats why God hates sin so much. 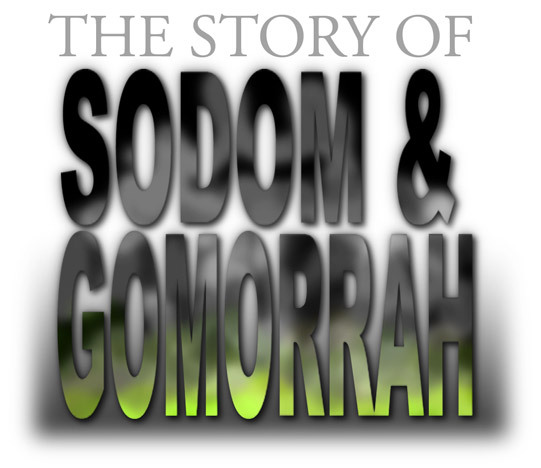 ...there were two cities named Sodom and Gomorrah. The people who lived there had turned away from God. They didnt care about God. They didnt care about doing what was good and right. In fact, they did just the opposite. They thought it was great fun to do what is wrong. Abraham had a nephew named Lot. Lot and his family lived in the city of Sodom. They cared about God, and tried to do what pleased him. Now, the evil in Sodom and Gomorrah was so bad that it was like a terrible, rotten smell that reached all the way up to heaven. And so God decided to put an end to it. Remember the three men who had visited Abraham and told him he was going to have a son? After they had gone on their way they came to a hill, and from that hill they could see the cities of Sodom and Gomorrah. Remember, one of those men was God himself, and when he looked down on the cities of Sodom and Gomorrah from that hill, he knew it was time to get rid of the evil there. But he also decided he wouldn't keep anything from Abraham. And so God went back and told Abraham what he was about to do. Abraham took a deep breath. He was about to argue with God! So God sent two angels to the cities of Sodom and Gomorrah, to see if there were just ten good people there. Abrahams nephew Lot met the two angels at the gate of the city. (The angels looked like ordinary men). Lot said, No, please, come and stay with us. Lot knew how evil the people in Sodom were, and that they would try to hurt the angels if the angels spent the night in the square. So the angels went to Lots house and Lot made dinner for them. Later that evening, in the dark of the night, the people of Sodom began to surround Lots house. Lot! We want to meet your guests, they shouted from outside the door. Send them out so we can say hello. But they were lying. They really wanted to have fun doing terrible things to Lots guests. Lot stepped outside the door to plead with his neighbors. Please go away and leave us alone, he said. But these evil people crowded all the more around Lots house. They were laughing and shouting horrible things. They pressed so hard against the house; they were about to break down the door. The angels reached out and pulled Lot back into the house and shut the door. Then they struck the men who were at the door with blindness so that they couldnt find the door. So Lot went out to speak to the two young men who were going to marry his two daughters. He said to them, We have to get out of this place, because the LORD is about to destroy the city! But the young men thought he was joking. And then God rained fire onto the cities of Sodom and Gomorrah. Thick, black smoke filled the air like smoke from a fiery furnace. But Lots wife looked back - even though the angels warned her not to - and she was turned into a pillar of salt. And so God wiped out the sin of the cities of Sodom and Gomorrah. Sin is a terrible, terrible thing. But God saved Lot and his two daughters.